The Sam F. Davis (G3) at Tampa Bay Downs was the lone points-paying Kentucky Derby 2019 prep of the weekend, while the San Vicente (G2) at Santa Anita Park and the Jimmy Winkfield at Aqueduct offered 3-year-olds the chance to jump into the Triple Crown gray. But the most eye-catching 3-year-old performances of the weekend didn’t come from the stakes races. Instead, they were found in allowance optional claiming events at Gulfstream Park and Fair Grounds on Saturday. Global Campaign, a half-brother to multiple Grade 1 winner Bolt d’Oro, missed his stakes debut in the Swale (G3) due to a foot issue and came back a week later to run 1 1/16 miles at Gulfstream. He sat a half-length off the pace, and while the horses around him were urged entering the homestretch, jockey Luis Saez asked little of mount. Global Campaign opened up by four before Saez geared him down. They crossed the wire 2 ¼ lengths in front while in a canter. The time was 1:44.29. Missing the one-mile Swale might have even played to Global Campaign’s favor, as the Curlin colt now has two-turn experience before his first Derby prep. He is possible to run March 2 in the Fountain of Youth (G2) at Gulfstream or March 9 in either the Tampa Bay Derby (G2) or Gotham (G3) at Aqueduct. At Fair Grounds, Dream Maker was making his first start in four months and also ran 1 1/16 miles. It was not the first time around two turns for the Tapit colt, but it was still a test in distance. Dream Maker clipped heels at the start of the Breeders’ Futurity (G1) at Keeneland in October, losing his shoe and part of his hoof. He needed time to recover, but trainer Mark Casse remained high on the colt. Dream Maker put on a show Saturday. He raced four wide into the first turn and down the backstretch, turned wide again when straightening for home and pulled away by 8 1/2 lengths. Jockey Florent Geroux only needed to shake the reins. Dream Maker hit the wire in 1:44.10, and the performance earned him an 89 Beyer Speed Figure. 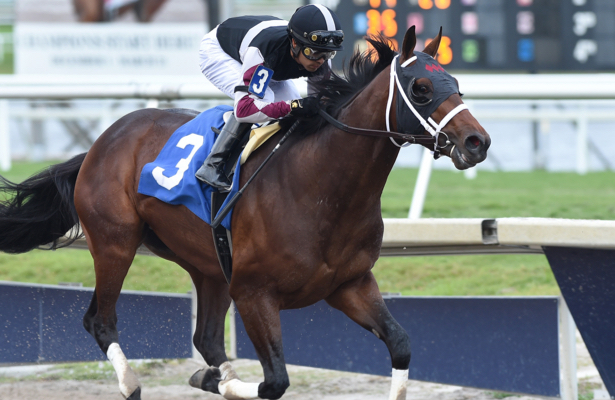 The Tampa Bay Derby is likely the next spot for Dream Maker. That gives four weeks in between races, with the Blue Grass (G2) back at Keeneland a possible final Derby prep. Dream Maker is a full brother to the Grade 1-winning turf mare, Dream Dancing. Well Defined much improved, but did he make a big impact on the Derby trail? In the points-paying Sam F. Davis, blinkers proved to be a big help for Well Defined. He was proven in Florida-bred stakes action at 2, but was off the board in his last two outings against open company. He scored a front-running victory at 7-1 and completed the 1 1/16 miles in 1:42.70 with a 93 Beyer Speed Figure. With favored Knicks Go finishing fifth, second choice and runner-up Kentucky Wildcat out with an injury and third choice So Alive a distant third, Well Defined could use another big win to cement his spot on the Derby trail. The Tampa Bay Derby is a possible next spot. Coliseum received another chance at stakes company in the seven-furlong San Vicente and was up against Bob Baffert stablemate Dessman. The gray colt broke slow, rushed up to challenge the lead and faded to third beaten 6 ½ lengths. Dessman almost got the job done in the slop but was run down by Sparky Ville and beat a nose. Coliseum has been a hot topic from the Baffert barn, but his Derby chances are looking doubtful at this point. He’s shown talent in his winning debut and morning works, but connections are still figuring him out between teaching him to break faster, rate and go on. Haikal had an impressive finish in the Jimmy Winkfield when rushing up the rail to win just in time, but he has yet to run beyond seven furlongs. Trainer Kiaran McLaughlin is considering the one-mile Gotham for him next out. Jockey Rajiv Maragh also believes there is more in the tank. Multiple Grade 1 winner Bellafina unsurprisingly scored another West Coast victory in the Las Virgenes (G2), but the winning margin was only three-quarters of a length. The daughter of Quality Road has opened up multiple times on her Southern California foes, and while the Las Virgenes finish was nothing flashy, it may not necessarily mean Bellafina is losing her dominance. Bellafina tends to sit close to the pace and take over early, but jockey Flavien Prat sent her straight to the lead when no one else went in the Las Virgenes. Trainer Simon Callaghan felt the track was playing to closers that day. Bellafina has won five of seven career starts. She was off the board only once when fourth in the Breeders’ Cup Juvenile Fillies. Her final Oaks prep will be the Santa Anita Oaks (G1) on April 6. While it may be too soon to say Bellafina has lost a step, the Las Virgenes finish did show that Enaya Alrabb is not a filly to take lightly on Santa Anita’s Kentucky Oaks trail. The Las Virgenes was only her fourth career start. She was caught by a head one start earlier in the Starlet (G1) at Los Alamitos, won by American Phaorah’s half-sister, Chasing Yesterday. On the East Coast, Point of Honor threw her hat into the ring by winning a Kentucky Oaks prep at Tampa Bay Downs. The Suncoast Stakes was only her second start, and she remains unbeaten so far in her career. Both races came around two turns, which also helps her chances moving forward. First time out Dec. 16, Point of Honor was a six-length winner at Gulfstream Park. In the Suncoast, Point of Honor rallied from last and pulled away by 2 ¾ lengths despite a wide trip. “She won her first race very easy, but the horses behind her that day were not much,” trainer George Weaver said. “I think this was probably an acid test for her and she passed it with flying colors. She was very responsive to Javier (Castellano) and the way she drew away was very impressive. Another 3-year-old filly of note is Winter Sunset, a daughter of Tapit and multiple Grade 1 winner Winter Memories. Winter Sunset is 2-for-2 on the turf at Fair Grounds and came from last to win the Shantel Lanerie Memorial Overnight Stakes. The victory showed a new dimension, as the filly led every step of her Nov. 29 debut.